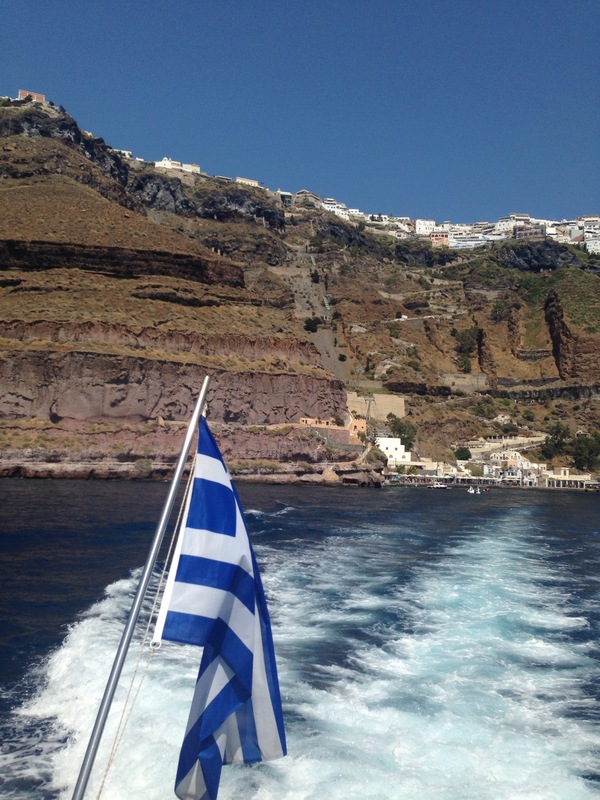 August 5, 2015 August 5, 2015 by Beau H.
The view from a small boat to Santorini, Greece. If you’re just joining us (or just catching up to TSG), this dispatch comes to you from the high seas! Specifically, somewhere between Greece and Italy for a family cruise. The biggest takeaway so far: what a trip it’s been. I knew going in (and packing) for the trip that it was bound to be incredible — but until you’ve experienced the beauty of this part of the world, there’s really nothing like it. It’s been an unmatched experience, but thankfully, my wardrobe has withstood the test to this point. 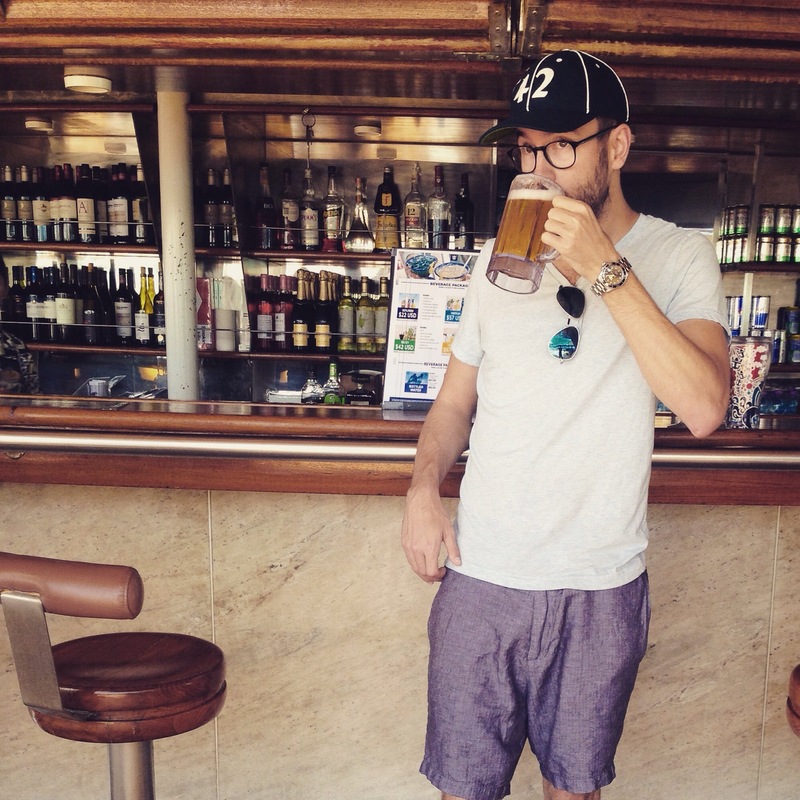 Exploring the port town of Civitavecchia, Italy pre-cruise with some comfortable Mott & Bow white denim. Brown leather chukkas by Timberland. I’ve had the chance to try out a few different outfit combos and to date, I’ve found my Mott & Bow white denim to be both comfortable and versatile, perhaps the best pair of pants I brought along. They’ve proven a crisp option for travel when paired with brown leather chukkas, and that’s equally true of my unconstructed J. Crew blazer (get the scoop on other great blazer options here). My GAP chambray shirt, in breezier situations, and my Banana Republic khaki shorts (in hotter temps) have also fared well, as have the range of summer T-shirt options I brought along –namely my Pistol Lake henley is a well-fitting yet breathable option, as is a lightweight H&M v-neck. And the Combatant Gentleman chinos I packed — soon to be featured as this week’s Style Pick — are casual yet tailored enough for dinner wear. Shore style in Santorini. Vintage ballcap by Goorin Bros. Sunglasses by Randolph Engineering. Charcoal pocket tee by American Apparel. French Terry Sweatshorts by Pistol Lake. Sneakers by Athletic Propulsion Labs. Black rubber strap watch by Stuhrling. Slim Mailbag by Satchel and Page. 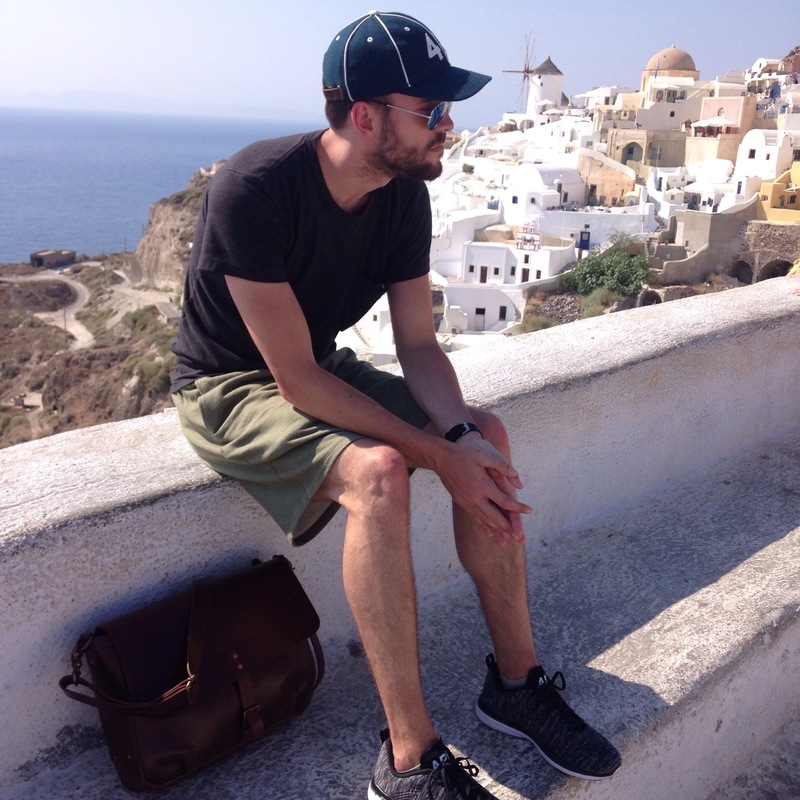 For a particularly strenuous shore excursion in Santorini, I turned to my Pistol Lake sweatshorts and sweet Athletic Propulsion Labs running shoes — hiking the mountains of Greece absolutely calls for it, yet thankfully, they’re futuristic and unique enough that they feel less like a running shoe and more like a new-age sneaker you’d see on a fashion runway. My Satchel and Page Slim Mailbag has also proven more than up to the test of tagging along for the journey, and it’s pretty neat to be carrying a bag that’ll only get better with age (full review of that in the coming weeks). Kicking back in casual style. Vintage ballcap by Goorin Bros. Blue V-neck by H&M. Shorts by Frank & Oak. Glasses by Warby Parker. Stainless steel dive watch by Invicta. Sunglasses by Randolph Engineering. Beer by Heineken. And in the rest of my downtime, I’ve found myself reaching for lightweight linen blends, like my Frank & Oak shorts or a Stock Mfg. Co shirt, plus crisp-casual accessories (like a versatile wool-blend Goorin Bros. hat or my trusty G.H. Bass brown leather loafers). My Orlebar Brown swim trunks (more on those here) are faring quite nicely, too. On the footwear front, my trusty GREATS Brand Wilson sneakers and Leather Wooster Slip-ons have also pulled some double-duty on shore trips and casual wear to date, and I’m excited to continue pairing them with the selection of chinos and denim I brought. 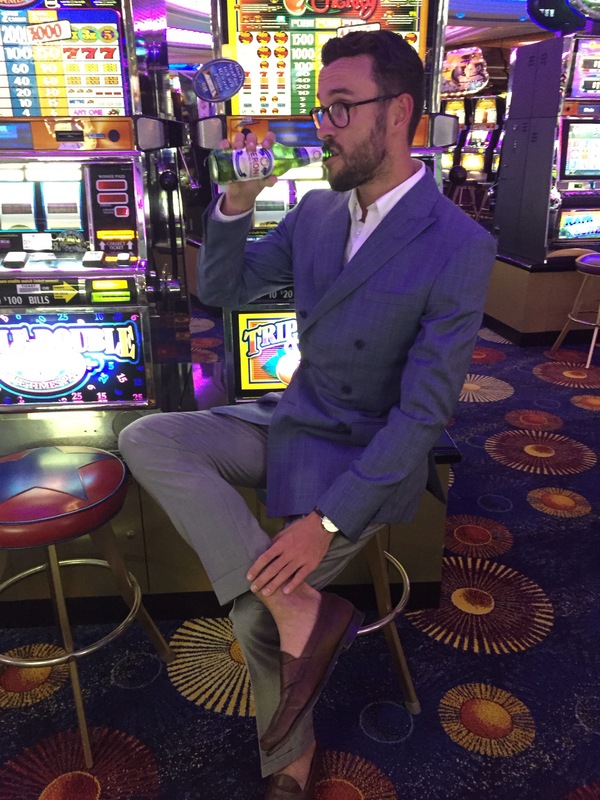 Hoping to strike it rich in my Combatant Gentleman double-breasted suit jacket, custom Black Lapel suit pants, G.H. 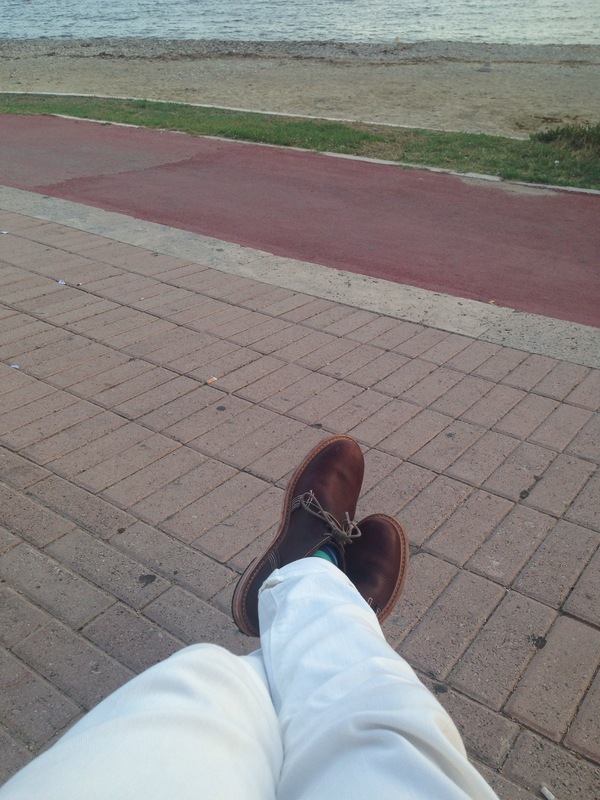 Bass loafers and Combatant Gentleman shirt. Watch by Daniel Wellington. Italian beer by Peroni. For formal wear, I’ve mixed and matched my Combatant Gentleman Steel Blue Glenplaid Double-Breasted Suit Jacket with some custom grey suit pants, brown loafers and a crisp White Endurance Shirt from Combat Gent, and my Combat Gent chinos as seen above (with some Andre Coton loafers) are also working well. On the accessories front, my Daniel Wellington Classic Bristol watch is holding up quite nicely — the pared-down, minimalist design is a big benefit when packing and traveling. Luckily, the weather’s proved sunny and warm, so I haven’t tripped up on not bringing outerwear — yet, that is. The rest of our trip calls for a bicycle tour and some town and shore exploration in Mykonos today, followed by stops in Athens and Katakolon! At any rate, check back here on Friday for the weekly Friday Read post, and swing back through on Saturday (if you feel like it) for the Style Pick of the Week. More coming from Greece next week on The Style Guide, too!